So the folks from Stewart's Mobile Village came over today to take a look at my awning. They left knowing exactly what parts they will need and what work they will need to do. It will be around $300 parts and labor. 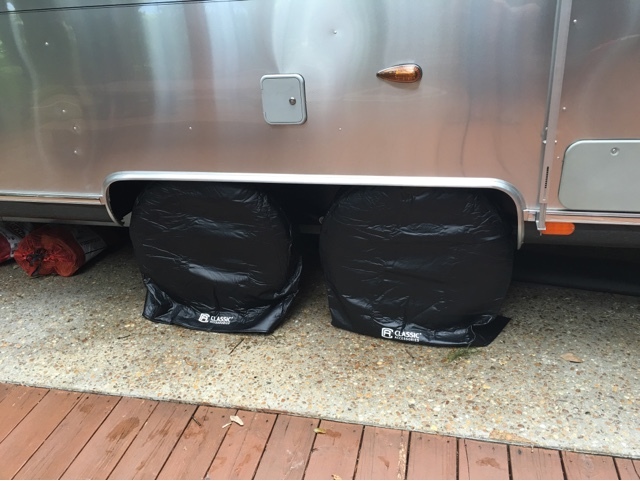 I bought some tire covers, but I can't believe I only bought two. 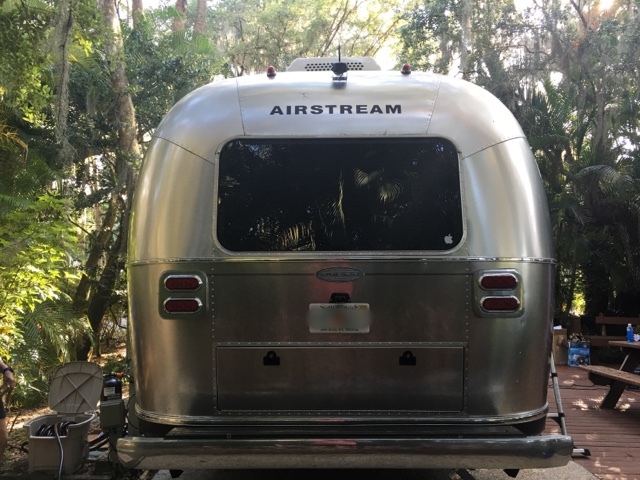 So one side of my Airstream is looking good. I ordered the second set from Amazon. It was super hot today. The kind of summer hot they warned you about in Florida. But it was a beautiful day. So this week we had the logo fix and the new WBCCI numbers on the agenda. Got them both done. Love it when a plan comes together. We gave up on trying to get AT&T to work in our park. We get intermittent service and not reliable at all. After the failed WeBoost experiment, we broke down and went to a Verizon store. Their coverage is much superior in our park. We got a Jetpack. Now we have a reliable and fast (18 Mbps) internet connection. We are paying for it, but such is life. Well, our AT&T signal boosting experiment failed. I finally got all the adapters and antennas connected, and nothing. We get intermittent service, the same as with no booster. So back they all go. Almost $700 worth of stuff. Thank God for Amazon's return policies. 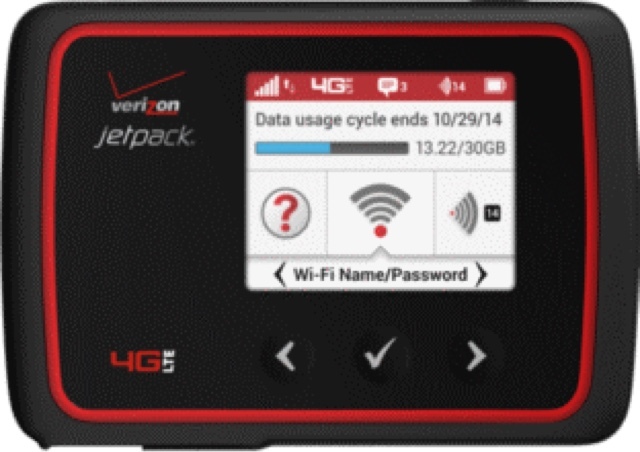 So, we went to a Verizon store and got a Verizon Jetpack. It hurts to pay Verizon when we have so many AT&T devices, but Verizon offers LTE service at the campground, AT&T doesn't. So we got a 6GB plan and now we are connected. 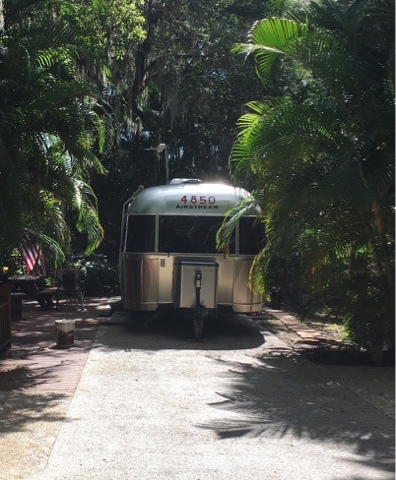 It's that day of the week again, when we pack our bags and head on over to our Airstream. I look forward to Fridays. I love Fridays. 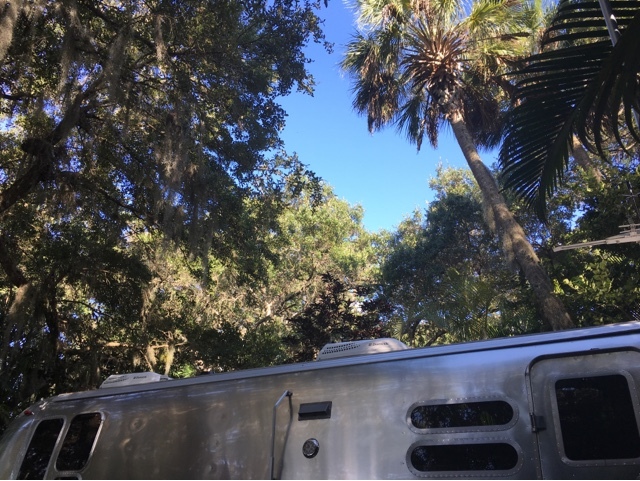 Not only are they the end of the work week, but the beginning of the Airstream weekend. We have some plans this weekend. 1. Test the new trucker cell antenna. 2. 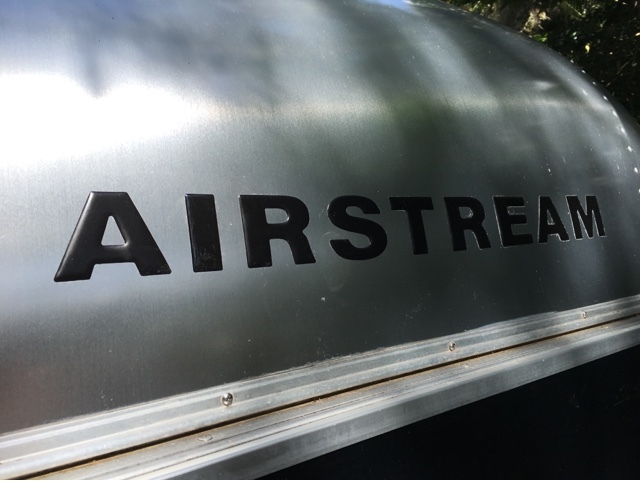 Replace the "I" from the front Airstream logo. 3. Install the new WBCCI numbers. 4. Run my golf cart until it runs out of gas. That's about it. Looking forward to it. Yay for Fridays! 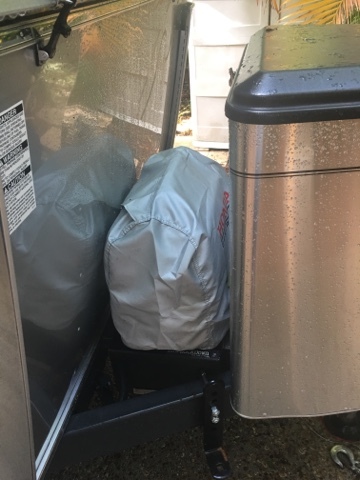 Well, between the thermostat reset procedure the Colonial RV service folks gave me, and some drain line unkinking and rerouting by an AC repair tech, both my ACs are cooling and not leaking inside the cabin. Yay! One down, a couple to go. Next week, the awning repair saga. So here's the deal. My ACs do not drain while the fan is on. Apparently the air flow causes some sort of vacuum or resistance that prevents proper drainage. So while the fan is on, water accumulates in the pan. When the fan shuts off, the pan drains beautifully. So, if the fans are set to AUTO, they turn off every once in a while (when the desired temperature is reached) and the pans drain fine. 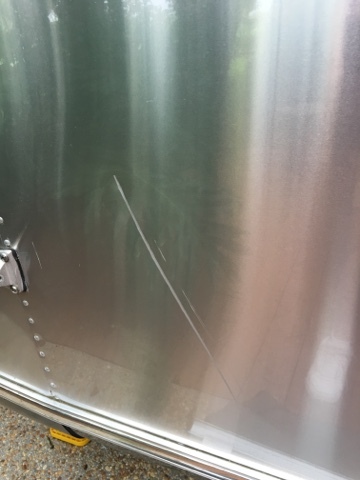 But, if I leave the fan on HI, after a couple of hours the pan fills up and the ACs start to leak inside the Airstream. Today is AC repair day. The ACs are off, but apparently the tabs that had to be removed no longer have to. There are drain lines that are supposed to drain the water but don't. We shall see. So we were able to remove the awning. It's amazing what a good nights sleep and breakfast can do for your attitude. The scratch on the side of my AS is not so bad. It could've been worse. Tomorrow I'll call a Zip Dee dealer to send a tech out and give me a repair estimate. 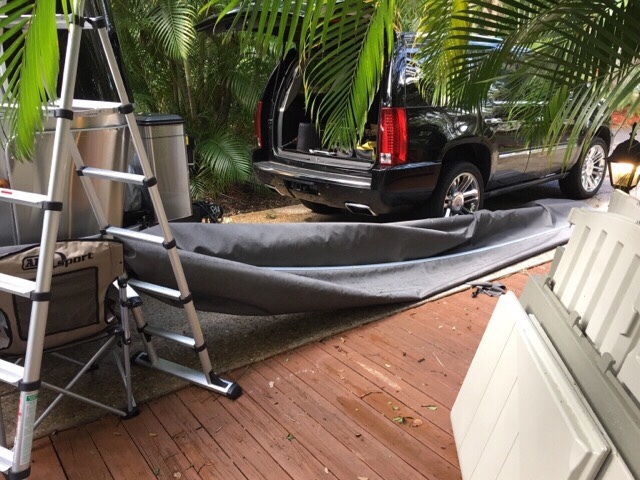 So I suffered a catastrophic Zip Dee awning failure today. We had flash rains, worse I have seen in a long time, and they hit while I was away at Lowes picking up something. 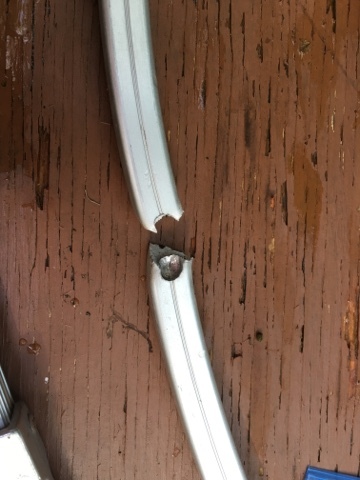 I got back to the trailer just in time to see one of the arms snap in half, the awning lose all tension, and a great big slash on the side of my AS. The rain subsided and we attempted unsuccessfully to manually roll up the awning. It's huge. It's a one piece the length of my 30 footer. I was able to remove the broken arm, and I removed the other one as well and now the awning falls flat to the floor covering the door. Makes getting in and out of the Airstream a bit interesting. It was getting dark, it was still drizzling, I was wet, tired and disappointed. So my plan was to take a pair of scissors and cut the awning off. My wife, being a bit more level headed, suggested I look up some removal instructions on the Internet. What the heck. If that doesn't work THEN I use the scissors. I found them. (The removal instrcutions). We found the one screw holding the cloth on one side, but it was late, I was tired, and decided to give up. Let's wiggle our way into the AS and go to sleep. Tomorrow is another day. I may even change my scissor plan B. It's hump day and all I can hear is crickets. 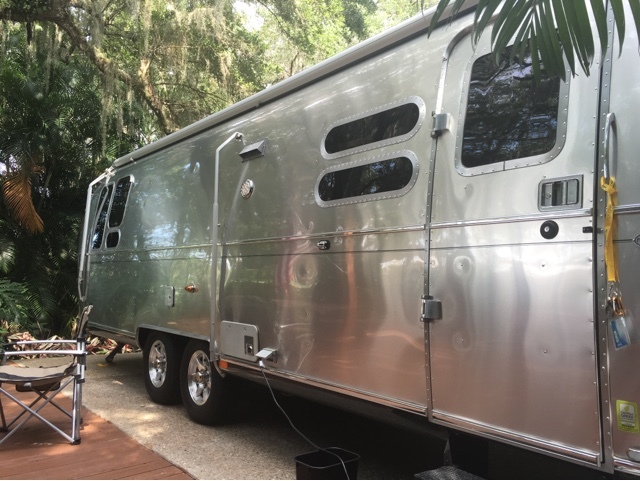 About my new Airstream. Work is a drag and I can't wait until Friday. My Dad joins us this weekend to spend Father's Day with us. We had my wife's cousin stay with us last weekend, and she "tested" the bed arrangement. This weekend we put on the new numbers from Squire Designs, and I do some minor mods to Eve (my golf cart), and some cleanup around our .08 acre lot (I figured it out). Sounds small but there is a LOT to clean up. 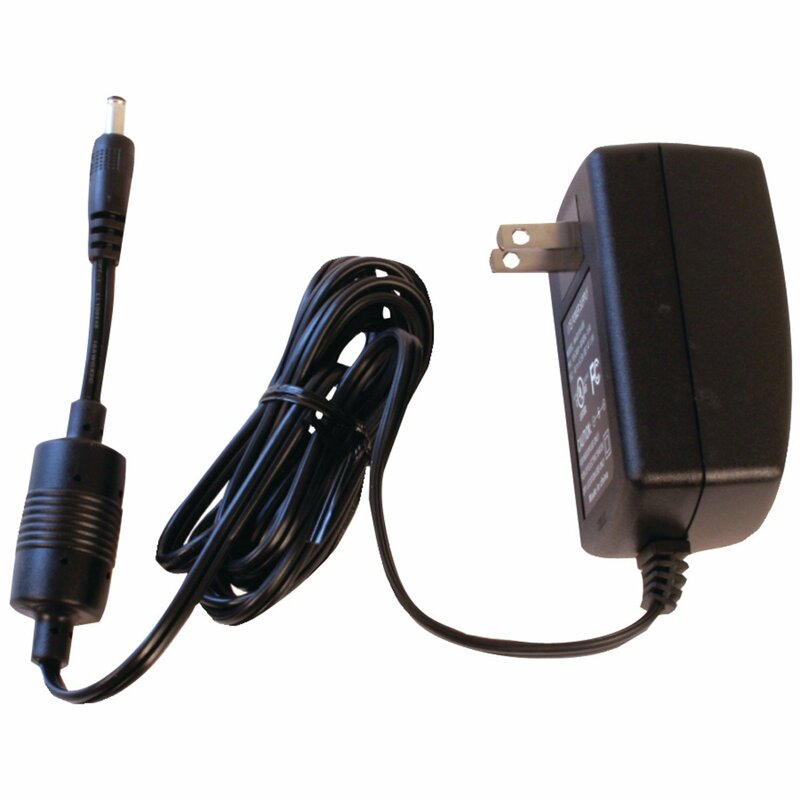 The Dometic authorized tech came out and looked at my ACs. According to him, the drain holes are blocked by some plastic tabs. The ACs need to be removed to get at the tabs. $250. Scheduled for next Monday. Stay tuned. 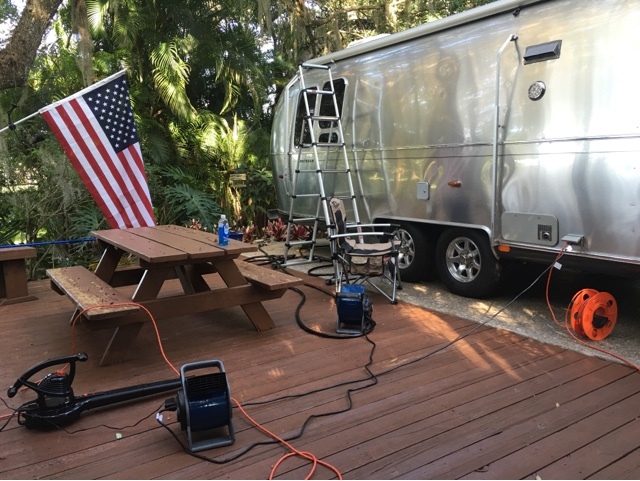 Shortly after we picked up our Airstream, the rear bedroom AC stopped blowing cold air. The prospect of taking in my AS for service was not appealing. I then find out the Airstream warranty doesn't cover appliances. The respective manufacturers warranties do, which don't transfer to new owners. I'm on my own. 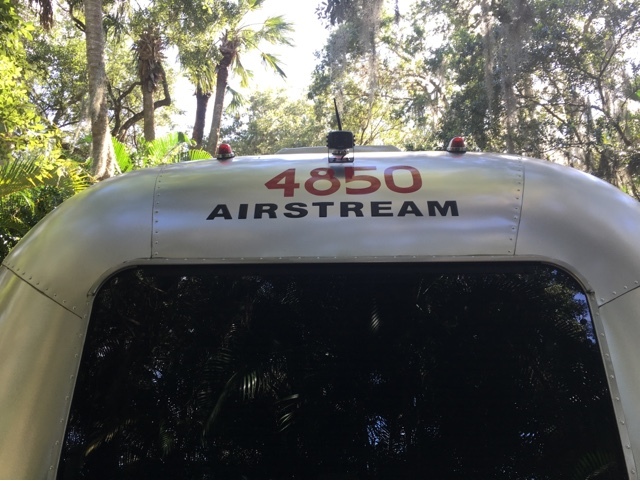 I contacted Colonial Airstream and Patrick was very helpful. He said he would help, but first he wanted his service guy to suggest a thermostat reset procedure. It worked. My AC blows cold air again. Yay! However, being in Florida in June, humidity is a problem. Both ACs are leaking water inside the cabin. There is water draining outside, so it must be the high humidity overwhelming the drain system. I had scheduled a tech to come fix my "broken" AC tomorrow, so I'll have him check the drains instead. 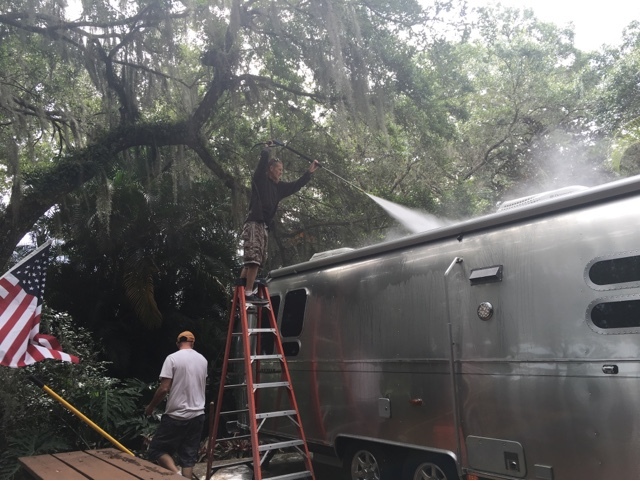 After cleaning my Airstream last week, I decided to call the professionals. $75 for a wash, $250 for a wash and a polish. The company is called PCS (Professional Coach Service) and the owner's name is Lee Fields. 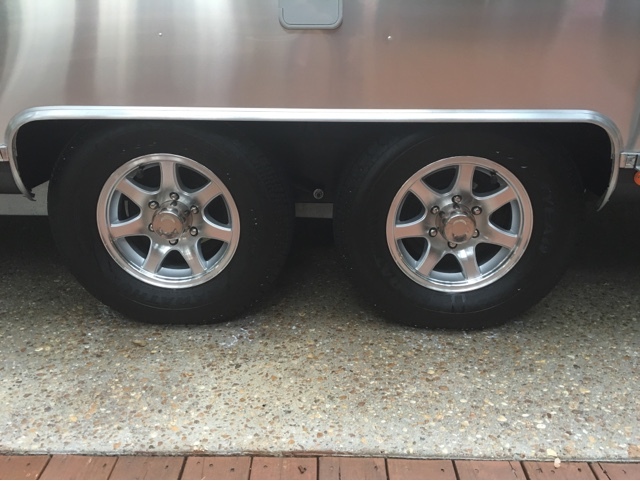 Very nice gentleman and very knowledgable about Airstreams. His number is (800) 925-9855. 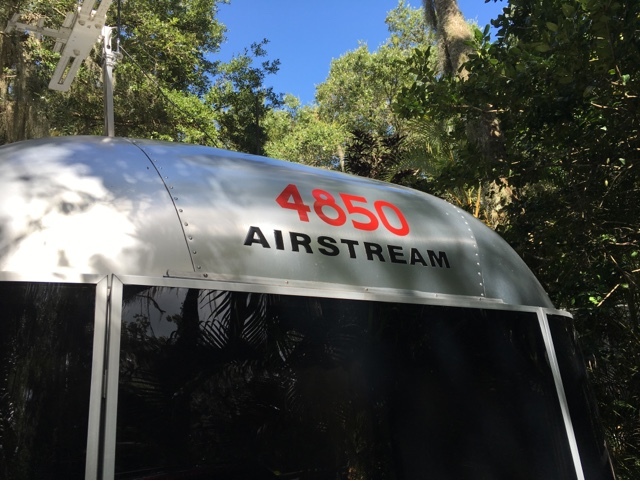 So if you have an Airstream in the River Ranch area, I recommend him highly. My wife's cousin was our first overnight guest in our Airstream. 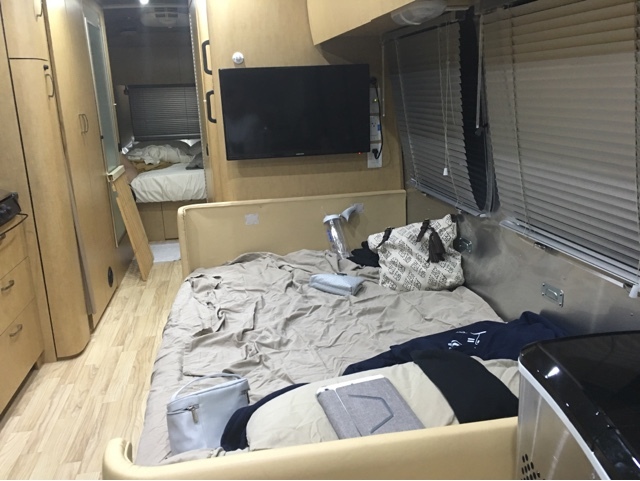 The dinette bed conversion was a hit. So I figured out why the external antenna is not working. 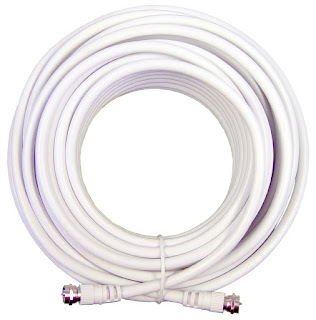 The cable end is female, and it screws onto another female end. From biology class I remember that two female ends, well, they don't work. I need a male to male adapter, one that screws on one and and can be screwed in the other. Whew. Amazon to the rescue. The internal antenna also needed a couple of adapters to work, as not only the biology of the adapters was not working, the size was different. Something tells me Wilson Electronics doesn't want me connecting these more powerful antennas to their 4X booster. We've had a Honda EU2000 for 15 years. We bought it for our boating excursions but rarely used it. I don't anticipate using it for the Airstream either, but I needed a way to carry it that wouldn't interfere with my other stuff. I attached this lock to the battery door by drilling four holes. The lock is designed specifically for the EU2000. 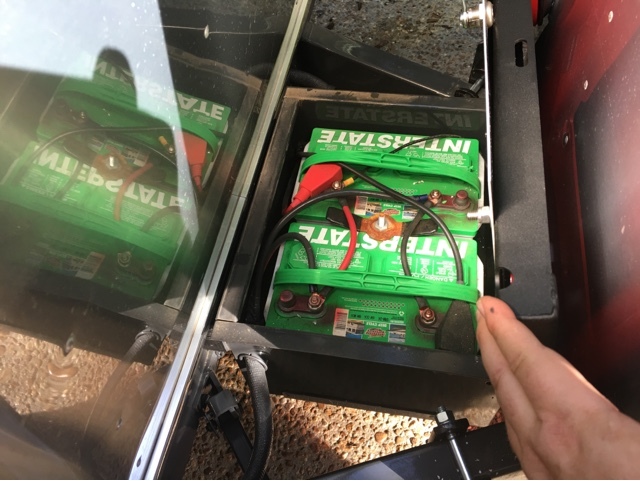 I can still operate the generator while locked, but obviously have to remove it to access the batteries. 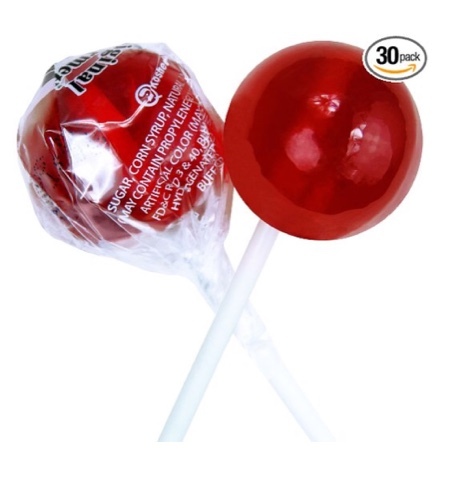 While at the Camping World store checkout, I scored some delicious gourmet lollipops. They come in all sorts of interesting flavors, my favorite being wild cherry. Through the magic of the internet I scored a 30 pack of these suckers from Amazon. I've never been a big fan of warranties. Too much fine print. 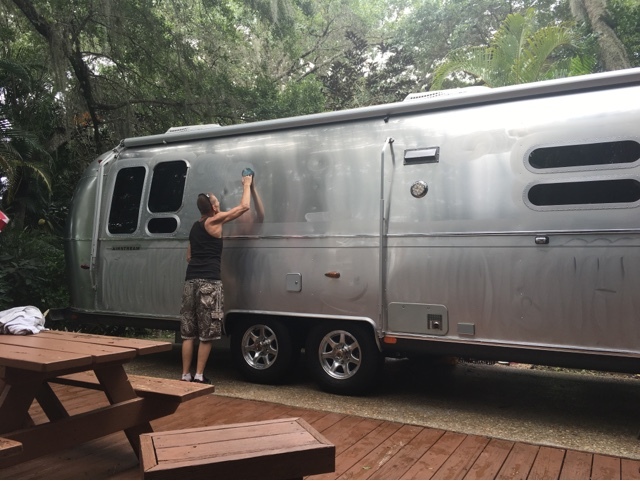 But when we found out we could transfer our Airstream warranty to us for the nominal fee of $250, we jumped at the chance. It was only 5 months, but hey, better than nothing, right? 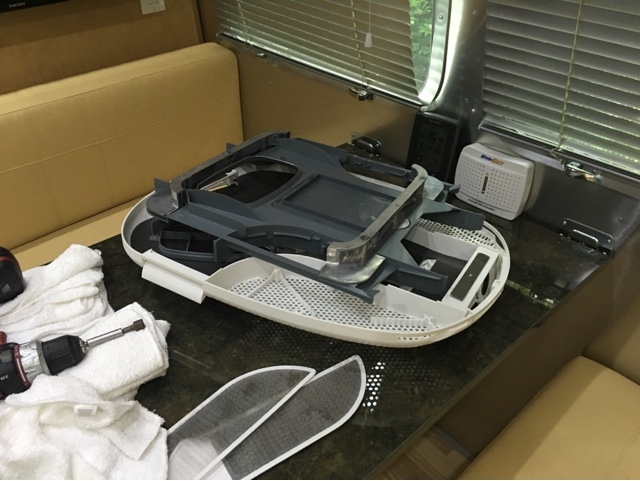 Imagine my surprise when I found out that the Airstream warranty does not cover appliances. Those are covered by their respective manufacturer's warranties. And guess what? Those don't transfer to a new owner. 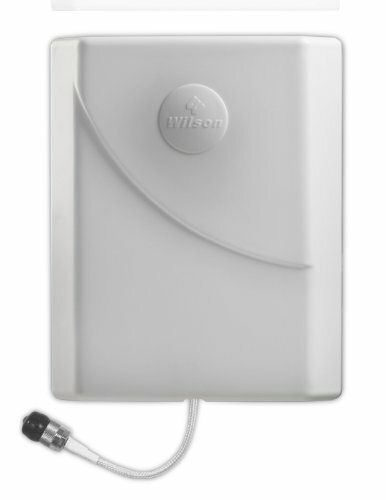 So we tried the Wilson Electronics signal booster and it kinda worked. Instead of no service, we get one bar, sometimes two. A couple of notes - the cable I bought for the internal antenna fits the antenna, but not the booster. The booster connection is smaller. So I had to get an adapter. 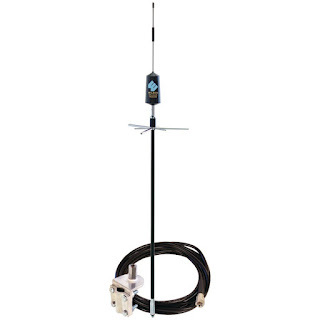 Second, when I tested the antenna I did so by putting it a top of a wooden structure I have on my RV lot, and it seemed to work, but when we attached it to the TV antenna on the top of the RV, it does not work. It must be some interference with the TV antenna. So next weekend we will need to uninstall the antenna and try something else. I may try the smaller magnetic mount antenna in the back of my Airstream. I got a 12" x 12" metal plate to put it on, and will try that. 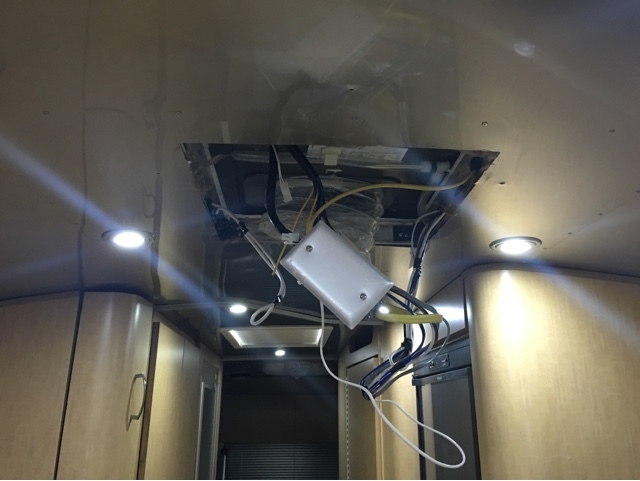 This means that the entire contraption will be installed in our bedroom instead of up front, but that internal antenna is supposed to cover 7500 square feet, which is larger than my entire RV lot. We will see. Stay tuned. So I contacted a company called Squire Design. I emailed Michael@SquierDesign.com. I got a response back from Rita. They sell the numbers at $2 each digit, but they are in proper sequence so they can be applied at once. So for $16 (plus $6.95 for shipping) I am redoing my numbers. Stay tuned. So we tried to put the big red numbers today. Well, we did. But they're not 100%. They are too thin and flimsy to handle. And the ladder was hard to position. 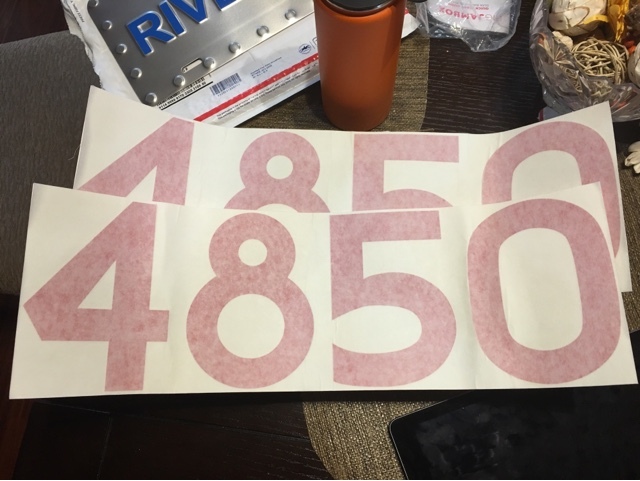 So I am planning to have them remade a couple of mils thicker and printed in sequence so I don't have to put them on one at a time. Note to the WBCCI. There is a much better way to do these. Today we washed the AS for the first time in anticipation of putting on the big red WBCCI numbers. It's a lot of work! So apparently the ownership of a golf cart is a requirement for the RV resort we stay in. 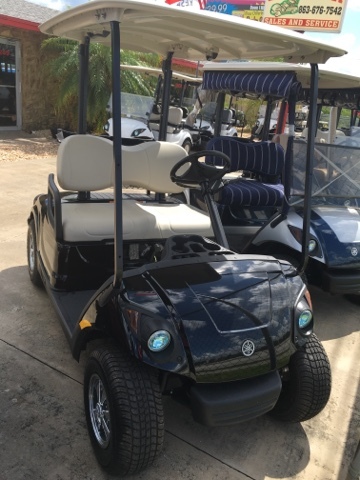 So we went shopping and after some consideration, decided to buy a 2016 Yamaha gas golf cart. 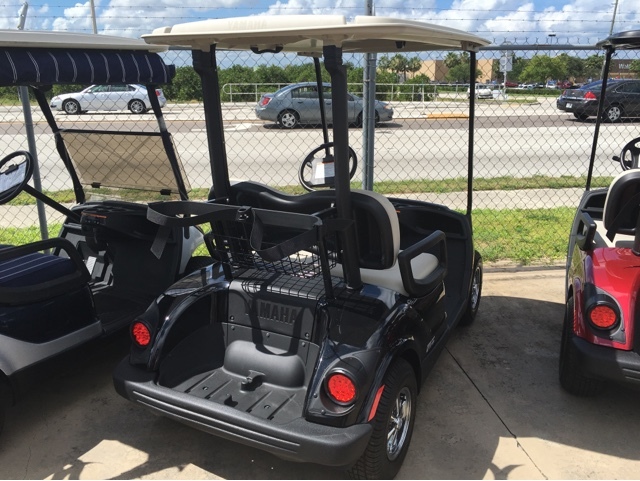 We bought the cart at Brewers Golf Cart in Lake Wales. Very nice sales person. He will add a windshield, rear view mirror, rear seat, and some new black rims (because you have to look good riding the golf cart). Here's pics before the modifications. We should get it delivered next week. I think I'm going to call her Eve. 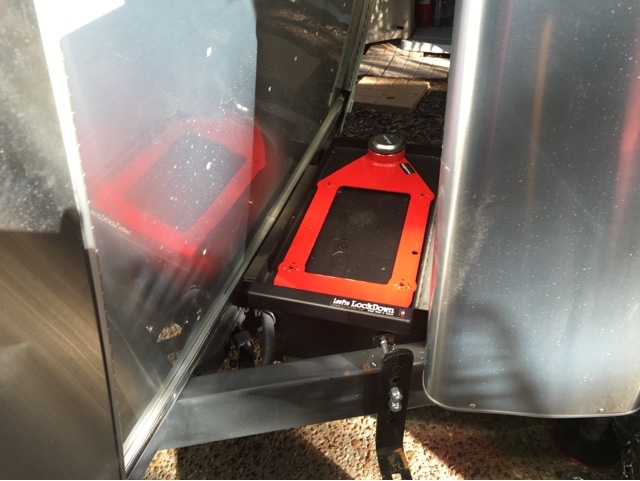 A ladder is an essential tool of RV ownership. There's just too many places to reach. 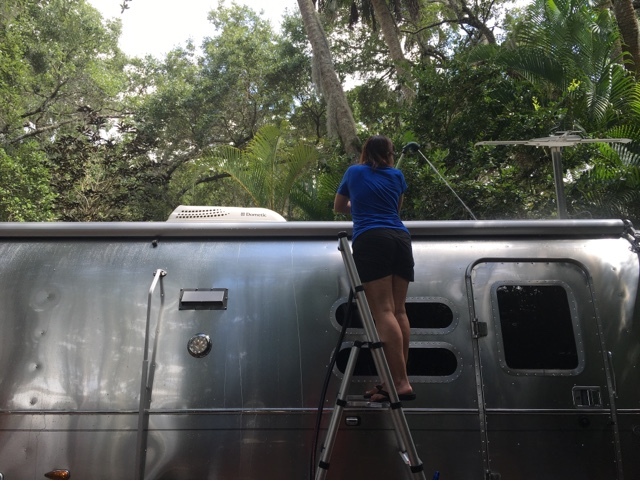 But carrying a ladder with you on an Airstream is... difficult. Enter Telesteps. 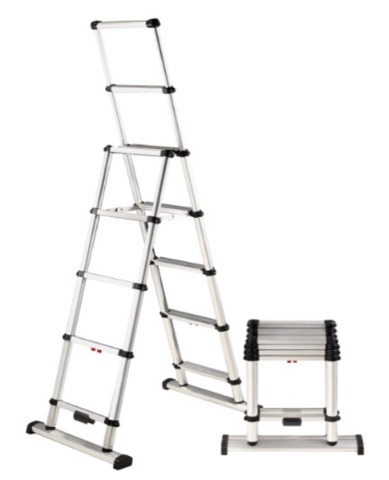 The make telescoping ladders. We bought a 12ft ladder that weighs 28 pounds and stores in the back compartment. It is very well made. And it costs an arm and a leg. Come to think of it, maybe less than an arm and a leg, which could be broken if I used a cheap ladder. 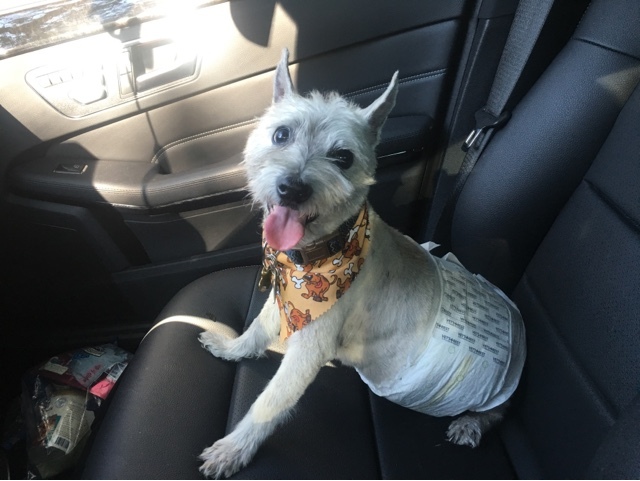 Sammy is my 15 year old Cairn Terrier. Think Toto of Wizard of Oz fame, but lighter colored. My wife and I don't have children, so we are heavily invested in this little dog. 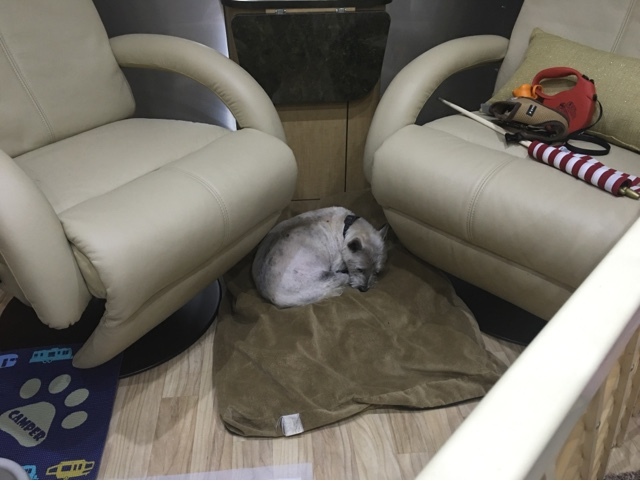 We boarded him with the veterinarian for our 10 day excursion to get the Airstream. At 15 he is a little bit too old for all that excitement. He wears diapers as he has lost all semblance of bladder control. And he is a little bit deaf and blind. But he's still got his appetite! Today we welcome him to our new home away from home. Welcome home Sammy! We have very poor cell reception at River Ranch. And the paid Wifi connection is not much better. So we decided to give the weBoost 4G-X signal booster a try. It is hard to find good information about antennas and connectors and things, so I kinda winged it. 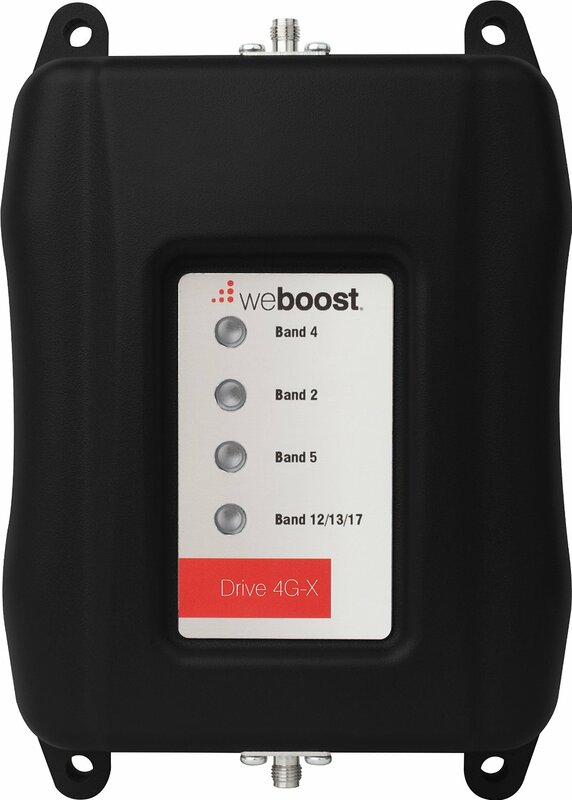 I got the weBoost 4G-X which is a mobile (car) version, because the home version was like $900. This one was already $479. So if this doesn't work, we go without cell service. In addition to this booster, which is designed to be installed in a car, I needed a couple more things. The antennas this kit brings seem inadequate for the RV job. So I got a bigger internal antenna and cable (so the phones can connect to it) and a bigger "trucker" external antenna (so it can connect to the cell service), and a 120V adapter (the included adapter was only 12V).